Ian Hanratty at Friendship Models took a brave step a couple of years ago when he took on the Jakeri range of figures form Pete Morton. The costs, risk and finance for the small producer are high, and I for one was delighted to see this original range of figures being saved and developed. Ian converted all the originals from metal cast to resin, a good move I believe, and he continued to add to the range of figures which now stands at 27 x 1/35 scale WW2 figures, 7 x 54mm Historical figures and 3 x 120mm scale figures. This is the 2nd of the new Wee Friends figures I had a look at, the first was the RN Sailor in relaxed mode which can be seen Here. Wee Friends figures come in a clear snap plastic box with a fold out colour insert depicting the figure front and rear, to aid painting. The fold out also includes the company name and product reference number. The figure is contained in a zip plastic bag within the box. Also included is a small leaflet showing the contact address, and phone number for the company. This leaflet contains an additional safety warning regarding working with resin. Cast in a light cream resin the figure depicts a Motorcycle Dispatch Rider in a standing pose, right leg slightly forward with his left arm hanging by his side, with the right arm at a 90% angle across the front of his body. The casting is very good with fine detail and I could only detect one small flaw on the chin of the rider. It’s either a slight air bubble or a big dimple!! The figure is in 5 parts, the body cast as a whole, separate arms and head and separate side arm. The figure is dressed appropriately. The upper body sports a British Warm leather jerkin. This has the appropriate number of buttons, looks the correct length and has a seam across the front and back, with one running down the centre rear. I looked at a number of references for the leather jerkin and there appears to have been two different types, one with no seam and one with. The no seam version was shown in ‘The British Soldier’ and the seamed jerkin in ‘The Canadian Soldier’. 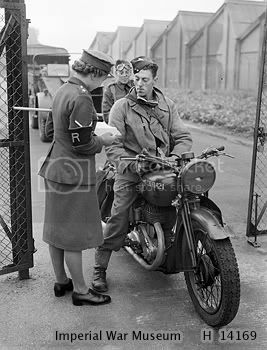 I can’t tell you if this makes him specifically a Canadian Dispatch Rider or not. On his legs he is wearing a pair of whipcord breeches, normal dress for the riders. These are well sculpted but lack the reinforced inside leather thigh patches. 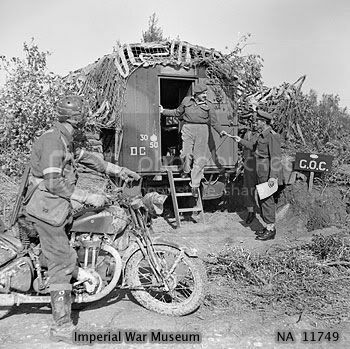 His lower legs are clad in a pair of dispatch riders boots, with socks turned down slightly over the top. The detail of the side buckles on the boots is very faint and would need a bit of work, the laces and boots in general look to be correct, but again the lace detail is a bit faint. Around his waste is a 37 pattern belt with a pouch moulded on to the LHS. Both front and rear brasses are present. The pistol holster attaches to the RHS and has a pouch above it. The detail is quite good but the pistol handle again quite faint. Both arms are well depicted and in his left hand he is holding a pair of leather dispatch riders gloves. The head sports the dispatch riders helmet on top of which are a pair of goggles. The face is that of a young man. Apart from the dimple on his chin (slight flaw) it has reasonably good detail, although I think the eyes are a bit lacking in detail. With a bit of care it should paint up well. Normal precautions should be observed when working with resin. Overall a very nice figure, the detail is there, but in places it is a bit soft, not as sharp as one might like, but I think this figure will paint up well and has a good natural pose. There is minimal clean up required and the figure should be of use to vehicle and diorama builders alike. The casting is much better than some of the larger producers figures I have seen, and overall a very acceptable figure. Highs: A good, well posed figure that could be used in any number of scenes. Lows: Slight damage to the heads chin, and the detail could be sharper in places. I agree----- how many more Zundapps and R75s' are we going to see, before we get a British Bike? Nice review Alan.